Elendilion – Tolkienowski Serwis Informacyjny » Blog Archive » G-i-P Report: Complete Sindarin dialogs from The Hobbit: The Desolation of Smaug! G-i-P Report: Complete Sindarin dialogs from The Hobbit: The Desolation of Smaug! This time, because of a lot of uncertainty, I can provide only a quasi-complete analysis of the Sindarin dialogues from the movie. L: Gyrth in yngyl bain? T: Ennorner gwanod in yngyl na nyr(y)n/nan yr(y)n. E(n)gain nar. Echannen i vegil hen vin Gondolin. Magannen nan Gelydh. L: I Nogoth… amman e tîr gi(n)? Tauriel? T: Ú-dangada? E orchal be Nogoth… …pedithig. L: Orchal eb vui… mal uvanui en. (subtitle) L: Why does the Dwarf stare at you, Tauriel? (subtitle) T: Who can say? He is quite tall for a Dwarf. Do you not think? It is Mereth-en-Gilith, the Feast of Starlight. Tauriel! Dartho! Ú-no hono. Ho hebo cuin. Farn! Tauriel, ego! Gwao hi! (subtitle) Enough! Tauriel, leave! Go now! L: Holo in ennyn! Tiro i defnin hain na ganed en-Aran! G: Edevín eb enedhor na gû a megil. En ú-nandollen. (subtitle) G: What about Tauriel? (subtitle) L: What about her? L: Cí Orch im, dangen le. L: Dandolo na nin! E gohenatha. T: Ú-’ohenathon. Cí dadwenithon, ú-’ohenathon im. (subtitle) T: I thought you were an Orc. 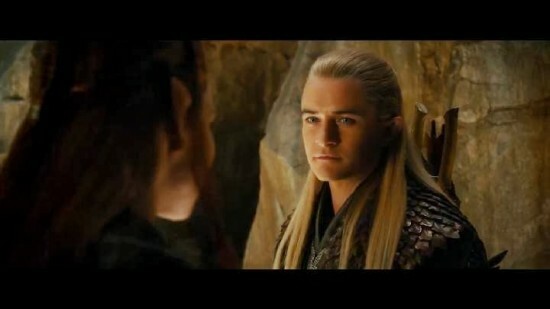 (subtitle) L: If I were an Orc, you would be dead. (subtitle) L: Come back with me. He will forgive you. (subtitle) T: But I will not. If I go back, I will not forgive myself. 9 Komentarzy do wpisu "G-i-P Report: Complete Sindarin dialogs from The Hobbit: The Desolation of Smaug!" I struggle with learning Elvish! I don’t remember words I just learned. However I recognise a few. When I watched DOS, I knew that Legolas said that Orchrist was made in Gondolin, and I also understood part of Tauriel’s spell as ‚save him from death’. I also thaught that ‚Close the gate! Keep it sealed by order of the King.’ must be ? ennyn ??? en aran. Concerning Tauriel’s „Ennorner gwanod in yngyl […]”, the logical ending is probably „[…] nan yryn”. The analyst, above, says that translated as “to/by the trees”, it does not „seem to make much sense in this context”. Why not? Yryn is probably the lenited form of ‚eryn’ = forest — the forest here being Mirkwood, or part of it. It makes sense : Tauriel is informing Legolas that the number of big spiders is increasing in the forest of Mirkwood, of which Thranduil’s kingdom represents the northernmost part. Concerning ‚Ennorner’ : ‚ennor’ means „middle land”. If so, the suffix -ner has to be explained. Maybe Tauriel is stating that the middle part of Mirkwood is being invaded by big spiders originating from the southern part — the Dol Guldur region. According to Salo’s book, we have to take note that the y-letter, in the movie dialogue, is pronounced as the French ‚u’ : and effectively, the actors playing Legolas and Tauriel do pronounce the y-letters as French u-letters — which English-speaking persons usually cannot pronounce, the English ‚u’ sounding like the French ”ou”. Two months later … Nobody has discussed my hypothetical post ! I was not 100% certain : it only was an hypothesis. Owner of the DVD, I have listened to Tauriel dozens of times, and I always hear the sound „u-run” (where ‚u’ is pronounced in the French manner), corresponding to „yryn” — because, according to Salo’s book, the letter ‚y’ is pronounced like the French ‚u’. „Eryn” means ‚wood’ or ‚forest’. In my previous post, I supposed that „yryn” was a lenited form of „eryn”. It was an hypothesis. In Tauriel’s sentence, another problem is „ennorner”. Since ‚ennor’ means „middle land” (according to Salo’s book), it is tempting to link the two words. The official English subtitle „Yes, but more will come” does not correspond in any form to what Tauriel is saying in Sindarin. I am sad that Professor Salo has not made public his views on the two ‚Hobbit’ movies dialogues, since he — and only he — is the creator of the movies’ Sindarin dialogues ! Only he can resolve all of the issues raised on this website. I have trouble understanding why fans of Sindarin have not tried to contact him … and why he would refuse to answer them. Could it be that ‚ennorner’ is unusual 3rd prs. past tense of **en-nor- i.e. to run again? Whith Ithildur’s intresting idea that would give ‚ennorner gwanod in yngyl nan yryn’ – the number of spiders have rentered (run again into) the forests. Naive? Tauriel : Run again number the spiders into forest = Numerous spiders have re-entered into the forest. She is answering Legolas’ question concerning the death of the spiders by informing him that the ones they have just killed were only a group belonging to a bigger invasion of spiders, coming from the south (originally, from Dol Guldur).